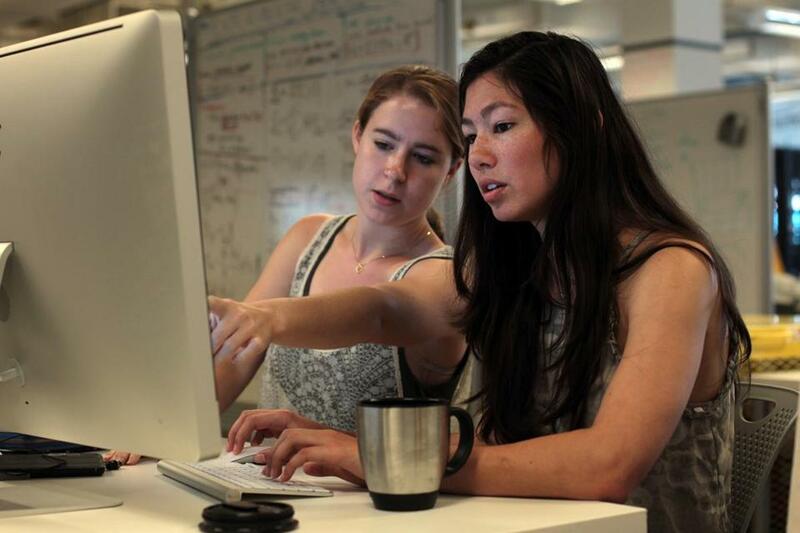 Emily Breslow (left) and Alana Pradhan work at the Harvard iLab for a start-up called Bobo Analytics. A newly minted PhD in the hot field of data analytics, Adam Marcus could have walked away from the Massachusetts Institute of Technology with his pick of lucrative jobs from any of the computing titans, from Google Inc. to Microsoft Corp. 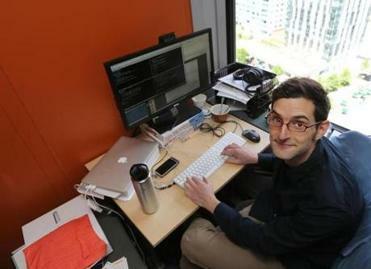 But like a growing number of his peers from MIT, and scores of other new graduates at top universities, he’s eschewing corporate America for the unpredictable world of scrappy Internet start-ups. Never mind that statistics show most start-ups fail. Marcus, 28, won’t even be at his commencement on Friday. He’ll be in San Francisco at the new offices of Locu Inc., a start-up founded by other MIT grads to help merchants and restaurateurs manage their online presence. This spring’s generation of graduates grew up with the Internet, when entrepreneurs such as Steve Jobs and Bill Gates were publicly acclaimed, and their more immediate role models were the youthful founders of Facebook Inc., who made their fortunes before turning 30. Now, they too want to follow recent grads before them, such as the founders of the photo-sharing app Instagram, who become overnight multimillionaires selling their upstart companies. Adam Marcus won’t attend commencement — he’ll be working in California. There are other factors beyond an early fortune driving the surge in start-ups. One is the lack of job security at big companies, the fraying of the “corporate safety net,” as Fenn said, in which downsizing and layoffs are routine. But the barriers to starting your own company these days are much fewer, Fenn said. Many graduates simply need a few laptops, a respectable Internet connection, and some seed money to get started. And finding money doesn’t seem to problem, either. Even the rawest of entrepreneurs are able to persuade veteran venture capitalists to finance their start-ups. The company Marcus went to work for, Locu, has raised $4.6 million from such seasoned firms as General Catalyst Partners in Cambridge. Last year, investors made 1,749 seed investments, which are typically less than $1.5 million, in early-stage tech companies, a 64 percent increase over the previous year, according to CB Insights, a New York firm that tracks start-up funding. Those types of start-ups include the typical Web business making apps for smartphones or writing software, but many young founders are starting non-tech businesses, such as running a food truck or developing ways to recycle garbage. “There’s so many start-ups, and so many are getting funded,” said 24-year-old John Melas-Kyriazi, who graduated with a master’s degree from Stanford University this week and will be working with StartX, a nonprofit accelerator program for start-ups connected to Stanford. A native of Brookline, Melas-Kyriazi found himself swept up in the start-up culture on and off campus, the constant buzz no doubt fueled by the success of Kevin Systrom, a Stanford grad who at 28 sold his company, Instagram, to Facebook in 2012 for around $700 million. “Literally at every coffee shop, at every restaurant you walk into, people are talking about something they want to build,” he said. But Melas-Kyriazi insists he and other young entrepreneurs aren’t motivated solely by money; they want to be in control of their futures and create something that has lasting impact or is as transformative as the iPhone. “You get to be the person in the driver’s seat making decisions,” said Melas-Kyriazi, chief financial officer at StartX. That’s what compelled Harvard College graduate Emily Breslow, 22, to turn down three job offers from big health care firms to work at Bobo Analytics, a start-up developing fitness and health monitoring for athletes, where she is, for all practical purposes, the company’s research department. Colleges are making it much easier for students such as Breslow to create a start-up or work at one. Every top American college and university offers classes in entrepreneurship or sets aside facilities where students can hone their ideas with input from outside investors and mentors from the business world. Breslow’s company, for example, is located at the Harvard iLab, which the university created in November 2011 to help start-ups developed on campus. It now serves as a kind of clubhouse for entrepreneurial-minded students and others in the Boston area. The number of these innovation centers at universities quadrupled between 1975 and 2006, from 104 to more than 500, and the number of faculty teaching entrepreneurship is now more than 9,000, according to the Kauffman Foundation, based in Kansas City, Mo., which supports entrepreneurship. Most young people leaving college still pursue traditional career paths at large companies. The start-up spirit seems strongest — not surprisingly — at schools known for their business and technology curriculums, and that have booming industries nearby. And it’s not just confined to the two tech zones on the East and West coasts. It’s happening in Austin, which has a vibrant young tech industry and the University of Texas, and in North Carolina, where the Research Triangle exerts a strong pull on nearby schools. 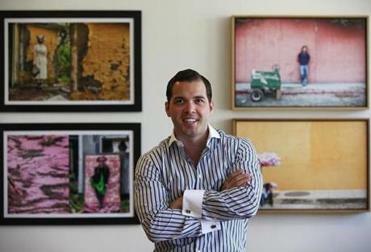 PreApps CEO Sean Casto knows the odds are against him but says failure can be synonymous with experience. In New Haven, the Yale Entrepreneurial Institute reported a 20 percent increase in the number of students applying this year for its start-up accelerator program; some 20 percent of all Yale freshman said in a school survey that they wanted to pursue entrepreneurship. At Northeastern, Sean Casto said students from across the campus — from architecture to engineering — constantly talk about start-ups. He started his mobile-app company, PreApps.com, while in school and, with a small amount of seed funding, is running it out of a small Newbury Street office with two part-time employees and five college interns. Casto, 23, is well aware the odds are against him. But in the world of start-ups, failure is often synonymous with experience and could lead to the founding of another business or a job in a similar company. Correction: Because of an editing error, the name of PreApps CEO Sean Casto was misspelled in a caption accompanying an earlier version of this story.